We had a good turn out for Team Fun’s rides last Saturday. 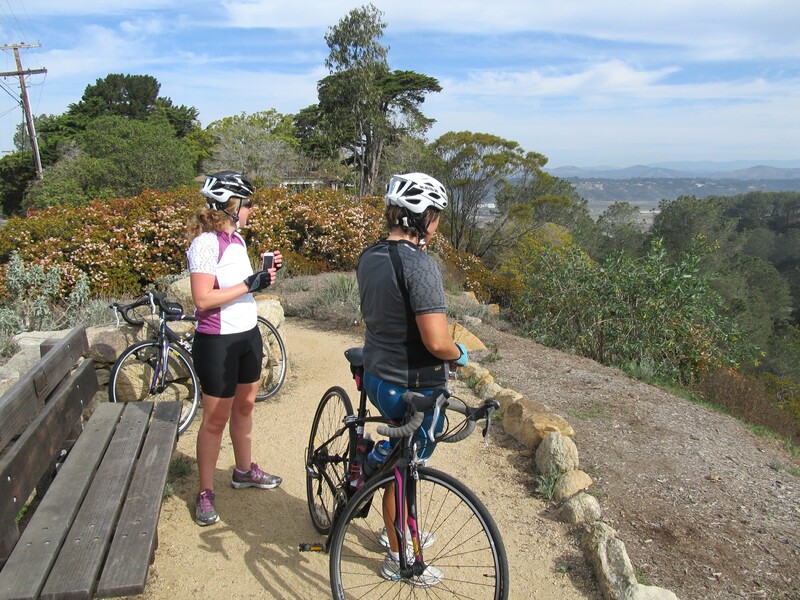 Most of the group went for an ambitious ride all the way to Cabrillo National Monument and back (an 80 miler) while Sian, Ellie and I went for a milder beginners-friendly ride down to Del Mar Heights and back on this route. Sian & Ellie heading south on Hwy 101 in Carlsbad. 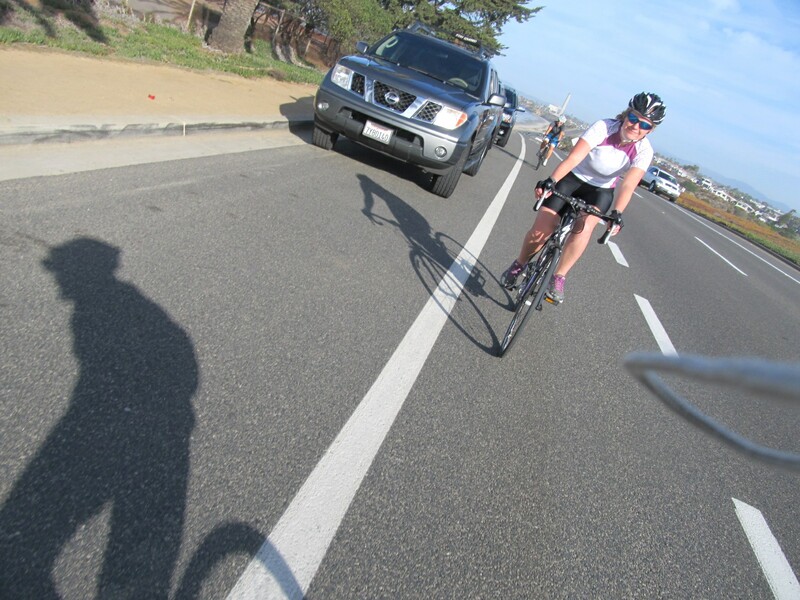 Sian looking on as Jill, Judy & Candance took a group of Team Fun 80 milers down the Coast Hwy. It was quite nice and smooth. And there was something exciting about having various team members popping through our little trio at various places en route. 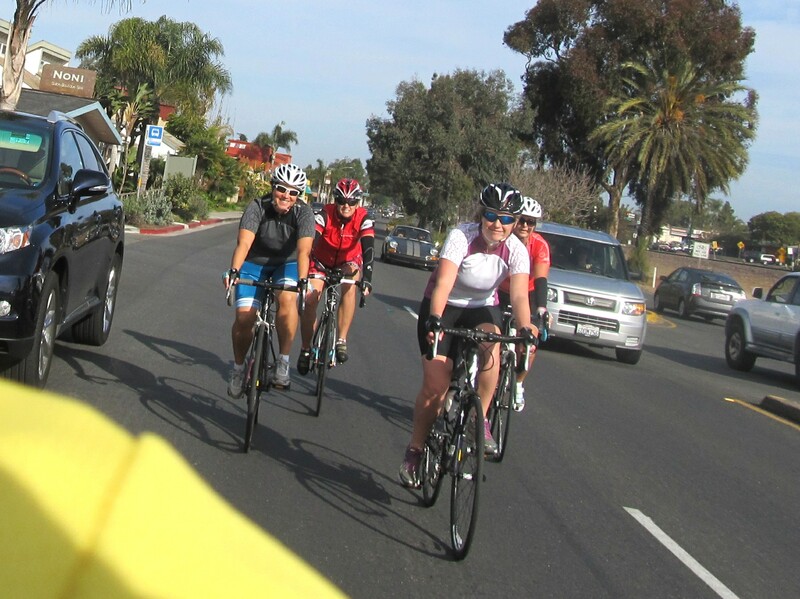 I thought all the 80 milers had gone past us in S Carlsbad when Heather & Kim suddenly turned up from behind in Leucadia. 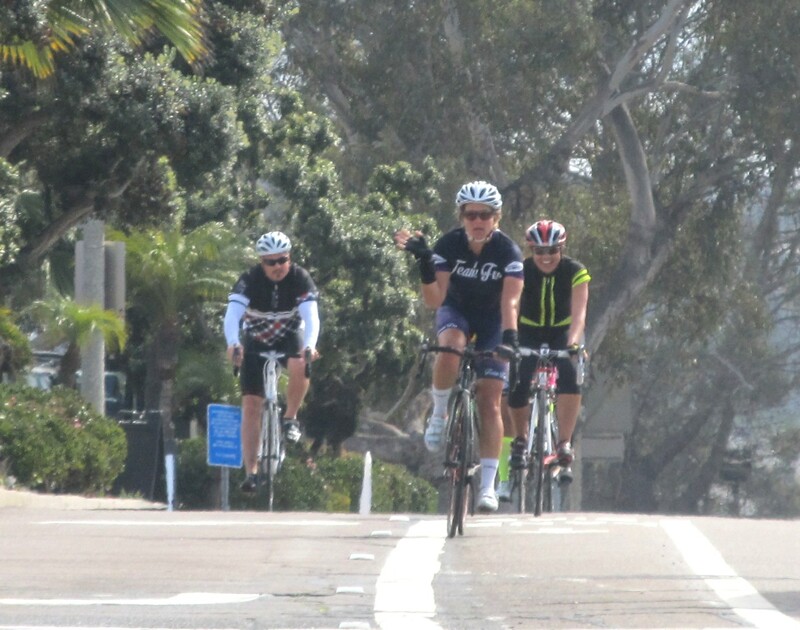 A couple of miles later we were then caught by Julie and another rider in Encinitas. Then on our return trip to Carlsbad we had a nice surprise when Judy & Candace came passing by in a blur of Team Fun colors. Kim & Heather heading south on Coast Hwy. Ellie, Julie, Sian on Coast Hwy in Leucadia. 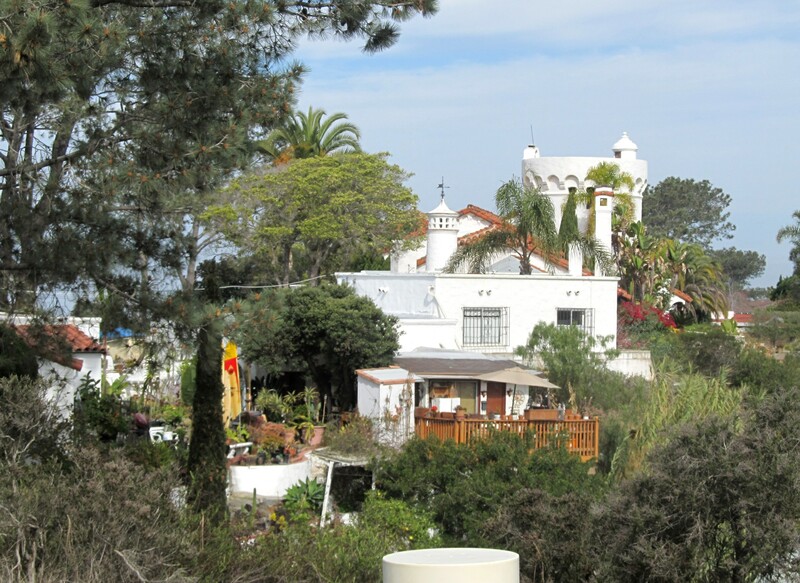 But, anyhow, Sian, Ellie and I made our way down the coast and then went hunting up in Del Mar Heights for the (used to be quite) famous Del Mar Castle on the top of the hill overlooking the racetrack. 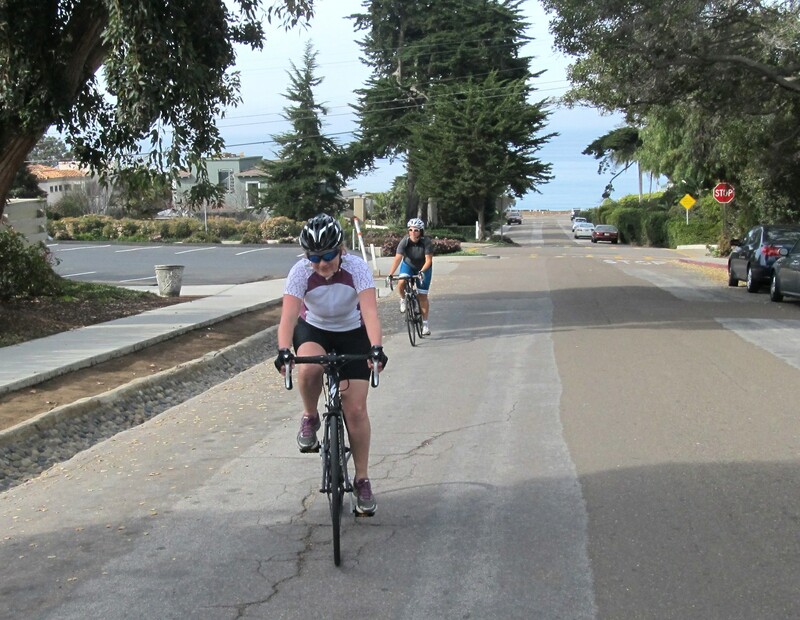 We took the Coast Blvd detour to avoid having to navigate the Jimmy Durante/Grand Ave merge and kept going south on Pacific Ave before turning inland (and up the hill) on 9th St.
Sian & Ellie climbing 9th St up Del Mar Heights. A rest stop with a view off Crest Dr.
Ninth St and continuing to the top on Hoska Dr is a couple of blocks’ worth of moderately testy climbing, but there was no traffic and the houses got nicer and nicer toward the top. We turned left at Crest Dr and enjoyed the sleepy and very scenic narrow lane with its many viewing spots and friendly residents. The best viewing spot, of course, came just past 15th St, rounding the gentle bend to find the elusive Del Mar Castle. 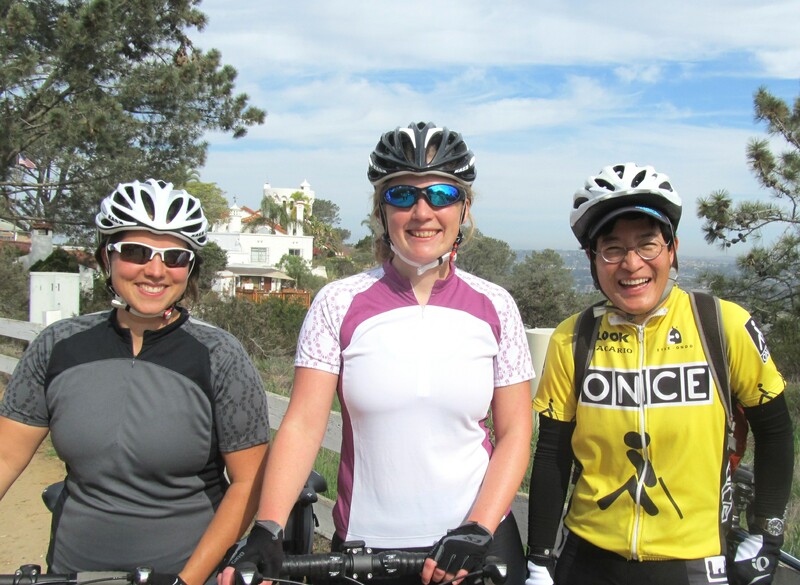 Del Mar Castle off Crest Dr.
Ellie, the Castle, Sian & Michell… very happy to have topped out the climb. It’s a rather cool mini castle built in 1925 by the Hardings and was the home of that infectiously positive weirdo Anthony Robbins until some time in the mid 90s when he sold it for two arms, two legs and a few internal organs to boot. I don’t know who lives there now, but it still looks quite splendid and the nice local lady who was passing by on her morning hike took a group photo of us with the castle in such a way that we look quite gigantic! From the crest of the hill we made a careful descent down the delightfully snaky Serpentine Dr to 15th St and retraced our route north. 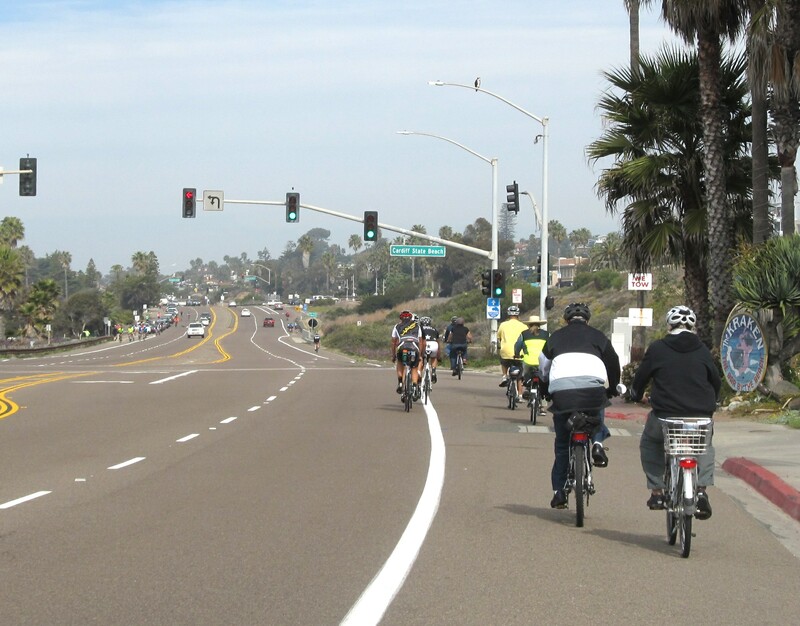 The Coast Hwy was crowded with bicyclists this morning! Many of them were even on e-bikes (you know, the cheaters’ bike with electric engine attached to the rear hub), however. We got quite swarmed by a group of those in Cardiff where a few breezed by me on the little climb up past the well-decorated Kook… pedaling. I don’t know why they were pedaling since they were on electrical power rather than legs. Getting passed by smoothly shaved cyclists on super light bikes on a climb is all well and good, but getting whiffed by big fat engined bikes as their riders mimed pedaling at 50 rpm bugged me a bit and I was tempted to throw my peanut butter & jelly sandwiches at electric peloton. Electric-assisted bikers heading north on Coast Hwy in Cardiff. 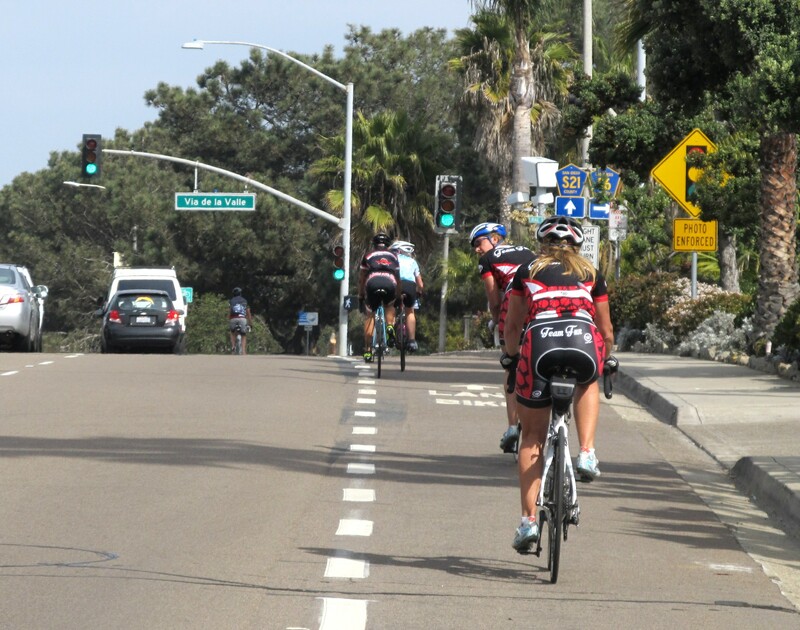 Candance & Judy zooming up the little climb to Via de la Valle in Solana Beach. The drivers were pretty nice today, tho. One lady even leaned out of her window and thanked us for stopping at a stop sign in Encinitas. That got me quite out of my sandwich-throwing mood and spared the exemplary well-behaved Sian and Ellie from having to witness a cycling food fight. We got back to Carlsbad before noon and I decided to set up a photo ambush of Team Fun 80 milers on my way back to San Diego. It was a bit tricky finding a good spot, but I ultimately settled for the top of the Coast Hwy climb into Solana Beach (at Via de la Valle) and scored a few frontal shots. Yey! (The lasses are so fast it’s usually pretty hard to get anything but fast-disappearing rear shots of them!). 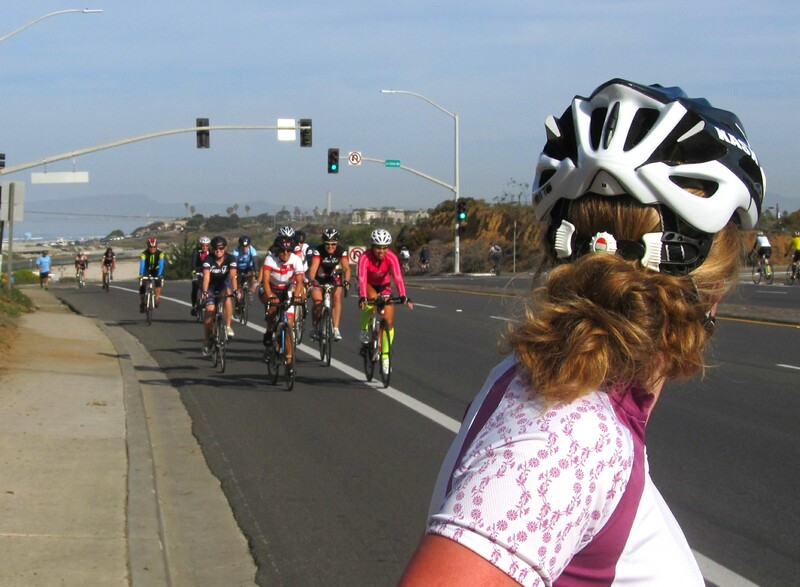 Heather Bru leading a group of Team Fun 80 milers up the climb to Solana Beach. 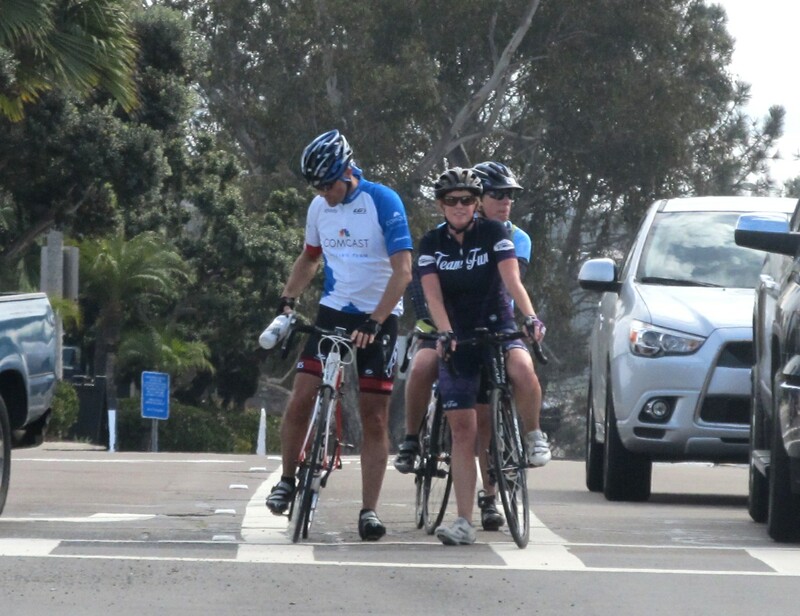 Achim, Jill & Suzanne waiting for the light on Coast Hwy at Via de la Valle. What a fun day of riding, thanks to everyone for coming! Ah, yes, the Del Mar Castle. I could find out in one minute who lives there now since I have Internet access to public records. More fun, though, is to know that it was it was built by architect Richard Requa who designed many well-known San Diego properties in San Diego, especially Kensington. He served as Director of Architecture for the 1935 Exposition in Balboa Park. I didn’t know that! Thanks, Russel. 🙂 I live pretty close to Kensington. Will pay more attention to buildings there when I cycle past now!